I can’t tell you guys how many times I’ve read this aloud to my kids. On preschool days where the parent would have to go in and read a book? That was it. The teachers loved it and the reactions from the kids was always so funny and amazing. The gist of this story is that the bus driver leaves you (the child, the reader) in charge of making sure the pigeon doesn’t drive the bus. 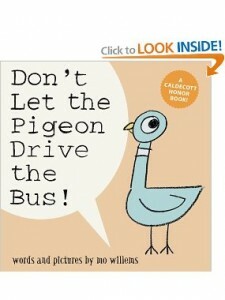 The whole book is the pigeon asking you if he could pleeeeeeeeeeeease drive the bus???? It’s adorable. Kids will shout out “No!” and laugh and laugh as the pigeon tries all sorts of antics to get them to change their minds. Of course the fun in it too for the parent is in overacting. I’d videotape myself reading it but then I’d have be totally embarrassed So you’ll just have to use your imagination but I love to go nuts with this book, especially in front of a classroom of kids! What are these books good for? Seriously anything from a toddler up to grade school. I read it aloud last night to my 6 and 9 year old and they were STILL entertained! There’s a whole line of book in the series. Don’t Let the Pigeon Stay Up Too Late, The Pigeon Finds a Hot Dog, The Pigeon Wants a Puppy and more. We have a couple of them and they are all great! You can see more on http://www.mowillems.com/ about the author Mo, and the infamous pigeon. 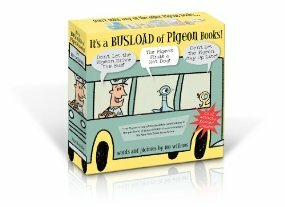 In celebration, you can also buy a box set of four books – It’s a Busload of Pigeon Books! ($16.49 on Amazon). The boxed set includes three favorites: Don’t Let the Pigeon Drive the Bus!, The Pigeon Finds a Hot Dog! and Don’t Let the Pigeon Stay Up Late! and an original poster illustrated by Mo Willems. Find the box set soon at your local book retailer.